Found in FNA Volume 21. Treatment on page 37. Plants 10–60(–120+) cm. Stems ± procumbent. Leaf blades deltate to ± rhombic or ovate, 13–37 × 7–32 mm, faces sparsely scabrellous to glabrate or glabrescent, gland-dotted. Fruits plumply ellipsoid to fusiform, weakly compressed, 7–9+ mm, 5–7-ribbed, lacking terminal spines, prickles ± uncinate, mostly along ribs. 2n = 22. Phenology: Flowering year round, mostly Jul–Aug. Introduced; Ala., Ark., D.C., Fla., Ga., La., Mass., Miss., N.C., Oreg., Pa., S.C., Tex., Va., South America, also introduced in Mexico, West Indies, Central America, Europe, Asia, Africa, Pacific Islands (Hawaii). 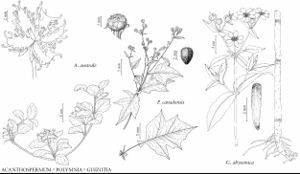 Reports of Acanthospermum xanthioides (Kunth) de Candolle from New York are evidently based on specimens of A. australe.